Hyde Park on Hudsonwas one of the movies on my must-see list when I whizzed up to London for a film preview day hosted by ShowFilmFirst. Why? 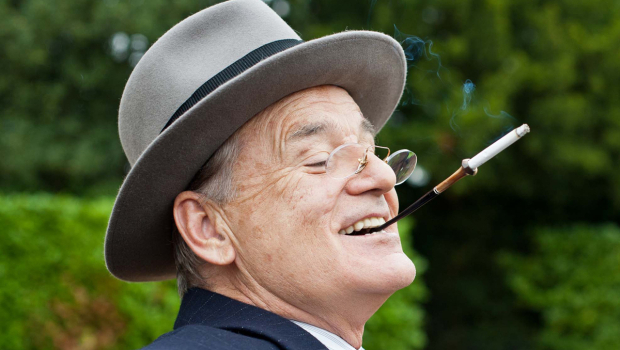 Firstly because it stars the brilliant Bill Murray as legendary US president Franklin D Roosevelt and secondly because the director is Roger Mitchell, of Notting Hillfame. Most of the action focuses on the real-life visit by George VI and his wife Elizabeth to Hyde Park (Roosevelt’s summer residence on the banks of the Hudson River) in June 1939. With the storm clouds gathering over Europe and Britain preparing for war, the king was keen to ask for the president’s support. The royals, however, are like fish out of water as they observe the comings and goings of the presidential household. Olivia Colman gives an impressive performance as Elizabeth, determined at all costs to keep a sense of decorum, worried that her husband is being laughed at and horrified that they will be expected to eat hot dogs during a picnic in the woods. Samuel West has the tough task of following in Colin Firth’s footsteps as George VI but manages it with aplomb (although every time he appeared on screen I couldn’t help thinking he looked exactly like Chancellor George Osborne). The emotional heart of the film is Roosevelt’s relationship with his shy distant cousin Daisy, played by Laura Linney. Daisy is summoned to Hyde Park to keep Roosevelt company – and she quickly obliges. The pair begin a passionate affair, unperturbed by the numerous other women in the president’s complicated life – his wife Eleanor (Olivia Williams), his domineering mother (Elizabeth Wilson) and his assistant Missy (Elizabeth Marvel). Hyde Park on Hudsonis beautiful to look at and Bill Murray gives a fine performance as the charismatic, wheelchair-bound Roosevelt. But to my mind The Ink Spots’ I Don’t Want to Set the World on Fire, part of the soundtrack, just about sums up this movie. What could have been a powerful film turns into one that is merely enjoyable – no more than that. Hyde Park on Hudson(certificate 12A) is released in the UK on Friday February 1.